Over the past few months we’ve been testing our new Sync services in Bluefire Reader. We’re pleased to announce that these new added-value services are now available to our white-label customers. Our Page Location Sync service helps our white-label customers make their branded apps more competitive with the addition of one of our most requested user features. Page Location Sync makes it easy for readers to move from device to device and pick up right where they left off. The service works on both our iOS and Android white-label app platforms. 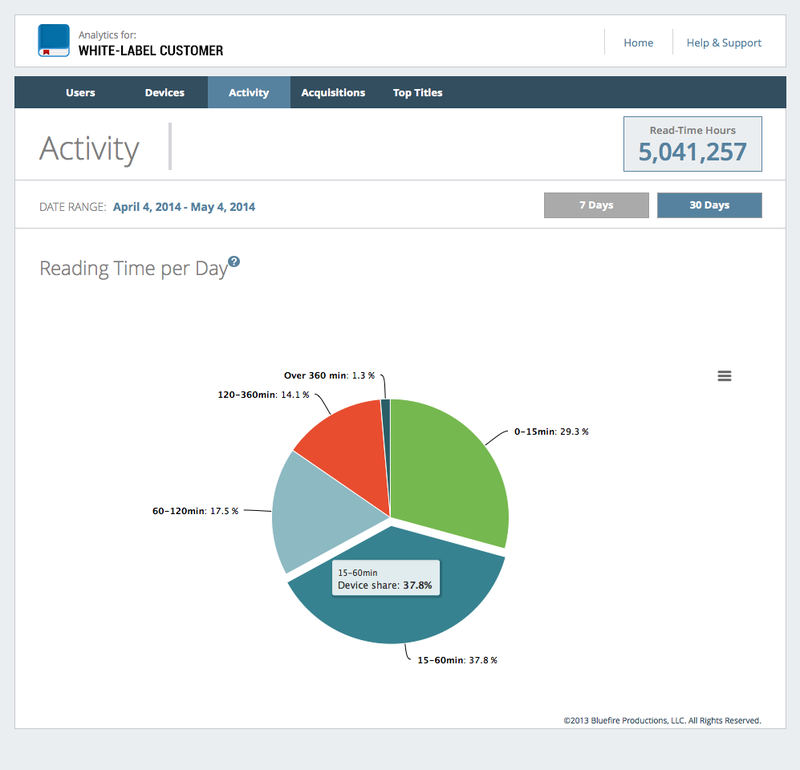 Bluefire’s new Analytics Service gives our white-label customers everything they need to start collecting and analyzing the key metrics that can help them develop a better understanding of how their apps are being used and what books are being read by their customers. The service includes an update of their apps that enables data tracking and collection. It also includes a personalized reporting site that they can access on demand to review and share their reports. Monitor trending titles to measure the impact of marketing campaigns and price promotions. Bluefire’s Sync and Analytics Services respect and protect privacy. Analytic data is aggregated and reported anonymously. Interested in learning more? Contact us! Attending the IDPF Digital Book Conference on May 28th and 29th in New York? Come see us in the exhibit area in the main hall on Wednesday the 28th. We are available for appointments on Thursday, May 29th and Friday, May 30th. Contact us to setup a time. We are also speaking at the conference. Micah and his fellow panelists will talking about what it really takes for publishers to sell direct. Join Micah, Doug Lessing (Firebrand Technologies) and Kristen McLean (Bookigee) on Thursday, from 11:50 AM to 12:35 PM in room 1E08.